Below is and overview of the events which the Rebild National Park Society is hosting in during July 2 to July 5, 2019. All events are open to everyone. 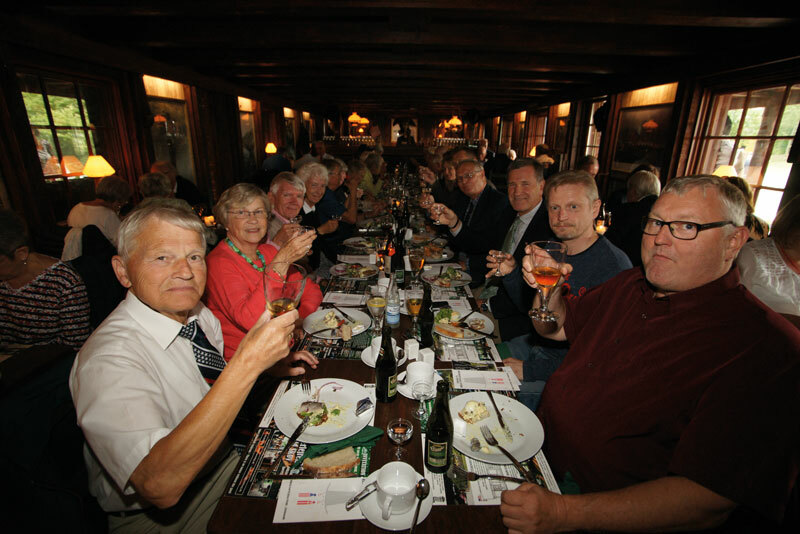 There are other events in the same period hosted by The American Club in Aalborg. Below the pictures is a complete overview. On July 2 from 13 PM-16 PM RNPS is hosting a Picnic in Rebild. During the Picnic someone is awarded with Top Karens Price. At 7 PM on July 3 the RNPS is hosting a Gala Dinner in Musikkens Hus” in Aalborg. ON July 4 the RNPS is hosting a Tent Luncheon with music, entertainment and singing. At 2 PM the Celebration will take place in the Hills. Keynote Speakers, music and entertainment. 10.00-12.00 Danish-American Club’s Garden Party (Free but remember to order tickets). 13.30-16.00 Rebild Society’s Picnic at Top Karen’s Hus in the Rebild Hills (DKK 230). (Only a limited number of seats available). 16.15 Transportation from Rebild to hotels in Aalborg. 11.00 Mayor’s reception at City Hall (Free). 15.15-16.00 Danish-American Club – Mayors Club. Planting of a tree in “Borgmesterlunden” in The Kilde Park (Free). 19.00 - 24.00 Gala Dinner at Musikkens Hus, Aalborg. Fireworks at 23:45. 18.15 Roundtrip transportation from Comwell Rebild Bakker to the Gala Dinner in Musikkens Hus, Aalborg. 00.10 Transportation from Musikkens Hus, Aalborg back to Comwell Rebild Bakker. 08.30 Wreath laying in Mindelunden at Almen Kirkegården (cemetary) in Aalborg (Free). 09.15 Roundtrip transportation for the Rebild Celebration from Hotel SAS Radisson (DKK 300). 09.30 Roundtrip transportation for the Rebild Celebration from Hotel Comwell Hvide Hus. 10.45-16.30 ”Little Rebild” - entertainment for children (Free). 11.30 The Rebild Society’s Tent Luncheon with music, entertainment and singing (DKK 375). 12.30-14.00 Gathering in the Hills with music and entertainment (DKK 150. Entrence is included in the tentluncheon ticket). American and Danish main speakers, music, entertainment and singing. 16.30 After-Party in the luncheon tent. Music and entertainment, and it will be possible to buy food, snacks, and beverages (Free admission). 17.00 appr. The first busses leave for Aalborg. 20.00 appr. The last busses leave for Aalborg. 10.00 The Rebild Society’s membership meeting at Comwell Rebild Bakker (Free). 09.15 Roundtrip transportation for the membership meeting from Hotel SAS Radisson (DKK 300). 09.30 Roundtrip transportation for the membership meeting from Hotel Comwell Hvide Hus (DKK 300). 12.30 Summer buffet incl. coffee (DKK 200). 14.00 Transportation from Comwell Rebild Bakker to Aalborg.